(New York) – Thai authorities should immediately drop all charges and release unconditionally 14 student activists who peacefully expressed opposition to military rule, Human Rights Watch said today. 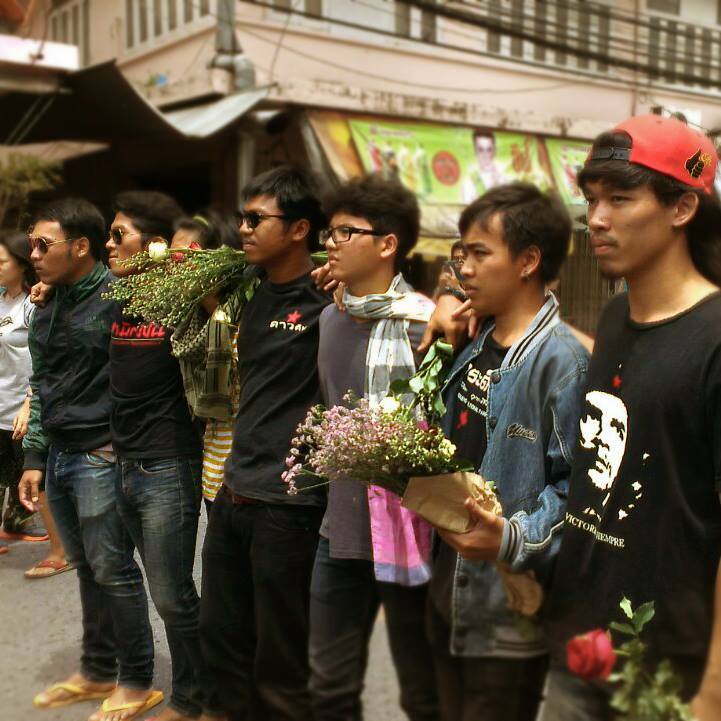 On June 26, 2015 in Bangkok, police and soldiers enforced a military court warrant to arrest 14 students from the Neo-Democracy Movement for sedition and violating the military junta’s ban on public assembly. The students are now held in the Bangkok Remand Prison and the Central Women Correctional Institution for 12 days while awaiting trial in a military court. On June 24 and 25 authorities arrested Rangsiman Rome, Wasant Sadesit, Songtham Kaewpanphruek, Payu Boonsopon, Apiwat Suntararak, Rattapol Supasophon, Supachai Pookhlongploy, Apisit Sapnapapha, Panupong Sritananuwat, Suvicha Pitungkorn, Pakorn Areekul, Chatupat Boonyapatraksa, Pornchai Yuanyee and Chonticha Chaengreo. The students took part in peaceful rallies calling for an end to military rule under the National Council for Peace and Order (NCPO). The army commander-in-chief, Gen. Udomdej Seetabutr, publicly accused the 14 student activists of being backed by anti-government groups and claimed their actions could lead to disturbances and violence. If found guilty of sedition under article 116 of the penal code, the harsh provision criminalizing free expression under Thai law, the activists would face up to seven years in prison. In addition, they would face an additional six-month prison term and a fine of up to 10,000 baht (US$312) for breaching the NCPO’s public assembly ban. These latest arbitrary arrests again demonstrate the military junta’s unwillingness to ease its oppressive rule. International human rights law, as reflected in the International Covenant on Civil and Political Rights (ICCPR) ratified by Thailand in 1996, protects the rights to freedom of expression and peaceful assembly. However, since the May 2014 coup, the junta has banned political gatherings of more than five people. The authorities have arrested at least 80 people for organizing or taking part in such public gatherings. The NCPO’s 37th order replaces civilian courts with military tribunals for crimes of national security and sedition, and for lese majeste (offending the monarchy). Individuals who violate the NCPO’s orders are also subject to prosecution in military courts. Hundreds of people, mostly political dissidents and critics of the NCPO, have been sent to trials in military courts since the coup. International human rights law prohibits governments from using military courts to try civilians when civilian courts are functioning. The use of military courts in Thailand also fails to meet international fair trial standards under the ICCPR. The United Nations Human Rights Committee, the international expert body that monitors state compliance with the ICCPR, has stated in its General Comment on the right to a fair trial that “the trial of civilians in military or special courts may raise serious problems as far as the equitable, impartial and independent administration of justice is concerned.” This is particularly problematic in Thailand where every element of military courts functions within the Defense Ministry’s chain of command. Since Thailand’s political crisis has arisen around the year 2005, with the undemocratic network of Thailand deliberately destroying our young democratization on several fronts, and particularly the self-legitimized military takeover on May 22, 2014, Thailand as a state member of the United Nations deteriorates politically, economically, and socially. Cores of democratization have been undermined. People’s rights have been violated and abused. Long-term visions of the country cease to exist, as political short-sightedness and petty revenge come to replace. In short, Thailand risks becoming a failed state, in the midst of global and regional challenges that put Thailand in a state of leadership or at least a significant player. Linkage politics, or the state of domestic determinants affecting foreign policies, of these anti-democracy elements, are bringing Thailand down. It is incredibly unfair to our citizens, whose grittiness and determination to engage in the world remain strong, to have a dictatorship regime blocking their opportunity. Thus, the Organization of Free Thais For Human Rights And Democracy is founded exactly one year ago on June 24, 2014, stating that we the Thai people do not take this situation passively or for granted. We regard the risk of becoming a failed state is Thailand’s major crisis. No matter which ideological group wins. No matter which colour is of advantage. The failure of the state of Thailand will be the ultimate end game to all Thais in Thailand and outside. We thus announce that the main strategy to prevent a failed-state status is the total elimination of Thailand’s dictatorship network. Our past struggle against dictatorship had confirmed that we the people stopped short of transforming a few past victories into the restructuring of the state of Thailand to rid ourselves of such dictatorial elements. Thailand’s dictatorship network still hides behind the facade of democracy, with continual effort to regain the upper hand. The battle for Thailand’s democracy must always bring us back to the revolution of 1932, as Thailand’s dictatorship network had grabbed that opportunity since then to battle with the people’s side until the present. 1. Abolish the Privy Council. In the past 10 years or so, most Thai people have witnessed with their own eyes that enormous political influence and subsequent interference of the Privy Council’s President and some of its members have been visibly exhibited, as if to show that the Privy Council were the de facto government of Thailand and not the elected parliament and government. Thailand’s ongoing political crisis stems from the negative and anti-democracy existence and role of the Privy Council all along. The Privy Council must not be allowed as an alternative to power struggle any longer. 2. Thailand’s armed forces must withdraw from the role of personal army of Thailand’s dictatorship network, and regard all Thai citizens as equal human beings. The actual status of Thailand’s armed forces as state within the state reduce them to the service of Thailand’s privileged class, which is actually the minority who enjoys so much power in the Thai society. We understand that most members of the armed forces are not in agreement with the service for a family or a few privileged groups, but they are forced in the strictness of military disciplines. We pledge to work along with these democratic cells of the armed forces to transform them into those of the people. Crucial military positions must be closely monitored, so must the usage of military personnels and weaponry. The management of other resources, from the budget to military “prohibited” areas, must be administratively watched. Military tribunal must not exceed the powers of the Judiciary, except in a time of war. All these measures are only the beginning. In due time, the Thai public must participate in the process of democratizing Thailand’s armed forces. 3. Thailand’s Judiciary must be beyond the political interference and influence of the dictatorship network. Not many Thais today believe that justice can be granted through the current state of the Judiciary, especially as a solution provider of ongoing political crisis. Quite a number of judges have close ties with the dictatorship network, and are firmly under their patronage. In 2007, during a democratic rally at Sanam Luang in Bangkok, there was a disclosure of an audio clip showing some judges and a government official planning their political strategy. As in Thailand’s armed forces, most judges, associate judges, and court officials wish for true and complete democracy, meaning that the Judiciary be regarded as free and unquestionably honourable. We also wish to work with them at an appropriate time. The organization of Free Thais For Human Rights And Democracy, in its first anniversary today, pledges to continue the effort in furthering Thailand’s democratization. On operations and networking, we have expanded to 51 provinces in Thailand and 18 other countries around the world, and will achieve more in due time, including a public coordinating office. Our organization intends to do what is right and not always what is temporarily popular. Thailand’s fate of not becoming a failed state is the most serious matter, as well as the state of democracy around the world. This mission requires absolute seriousness and prudence all through. Thank you for the opportunity to appear before you today. I am honored to be President Obama’s nominee to serve as the United States Ambassador to the Kingdom of Thailand. I thank the President for the confidence he has placed in me by putting me forward to the Senate for consideration, and thank Secretary of State Kerry for his strong support. I am grateful to all the members of the Committee for this chance to speak to my qualifications and intentions. I joined the Foreign Service in 1980, and have sought throughout my career to develop the experience and skills to lead interagency colleagues in strengthening our country’s security and advancing our prosperity. If confirmed, serving as Chief of Mission in Bangkok would be the culmination of that 36-year effort. My family is my greatest strength. I would like to express my love and gratitude to my wife Jackie, daughters Ashley and Teddie, son-in-law Chapin and granddaughters Josie and Cybbie. Thailand and the United States share a long and enduring friendship. Thailand is one of our oldest treaty allies in Asia. We collaborate on a remarkably wide range of issues, including advancing regional security, expanding trade and investment, enhancing public health, assisting refugees and displaced persons, countering illegal narcotics and wildlife trafficking, fighting transnational crime, and protecting the environment. Despite the limitations we have had to impose on aspects of our engagement after Thailand’s May 2014 military coup, few bilateral relationships are as broad and yield as many benefits to both countries. Over the past decade, Thailand’s internal political divide has dramatically deepened, polarizing not just the political class but society as a whole. We have not taken sides in this debate, but have stressed our unwavering support for democratic principles and our commitment to our historic friendship with the Thai people. Since the coup, the United States has consistently underscored both publicly and privately our concerns about the disruption of Thailand’s democratic traditions and accompanying restrictions on civil liberties, including freedom of expression and peaceful assembly. We maintain that democracy can only emerge when the Thai people freely and fairly elect their own representatives and leaders. As required by law, the United States has suspended certain assistance until a democratically elected civilian government takes office. When that occurs, our bilateral relationship can return to its fullest capacity. Our call for the restoration of civilian government, a return to democracy, and full respect for human rights, including freedom of expression and of peaceful assembly, does not mean we advocate for a specific constitutional or political blueprint. Those are questions for the Thai people to decide through an inclusive political process that allows for an open and robust debate about the country’s political future. If confirmed, I will continue to support the democratic aspirations of the Thai people. Mindful of our long-term strategic interests, we nonetheless remain committed to maintaining our security alliance. Thai and U.S. troops fought side-by-side during the Vietnam and Korean wars, and together we hold many bilateral and multilateral exercises, engagements, and exchanges, including Asia’s largest multilateral military gathering, Cobra Gold. These interactions provide invaluable opportunities to increase coordination and cooperation, including on providing humanitarian assistance and responding to natural disasters. The United States is Thailand’s third largest trading partner, and American companies are major investors in Thailand. Our Embassy in Bangkok, supported by our Consulate General in Chiang Mai, is a regional hub for the U.S. government and remains one of our largest missions in the world. We collaborate extensively on public health issues, a cornerstone of our bilateral cooperation, including promising research on a possible vaccine for HIV/AIDS. Our people-to-people ties are strong and growing. Educational linkages help thousands of Thai and American students study in each other’s countries. The Peace Corps has deployed volunteers across Thailand for over 50 years. The American people have long admired and respected Thailand’s rich traditions and culture. His Majesty King Bhumibol Adulyadej, the only monarch ever born in the United States, has led his people with compassion and integrity for almost 70 years and has been a tireless advocate for the advancement of the Thai people. Thailand is a founding member and a leading voice in all of the region’s multilateral institutions, including the Association of Southeast Asian Nations (ASEAN), the East Asia Summit, the AsiaPacific Economic Cooperation (APEC) forum, and the Lower Mekong Initiative (LMI). The United States will continue to work with Thailand and through the region’s institutions to further our mutual goals of stimulating trade and economic growth and promoting regional security. We work with the Thai government to strengthen its efforts to address the country’s human trafficking problem. We also support civil society organizations that help identify and protect victims and promote the rights of migrant workers. If confirmed, I will encourage Thailand to take robust action to combat human trafficking. For many years, Thailand has been an important partner on humanitarian issues. It hosted hundreds of thousands of refugees after the Vietnam War. Today, Thailand shelters some 110,000 Burmese refugees and asylum seekers in nine refugee camps along the Thailand-Burma border, as well as the Rohingya and vulnerable populations from some 50 nationalities. Thailand hosted a regional conference in May on the migrant crisis in the Andaman Sea and Bay of Bengal. We continue to work closely with Thailand and other affected countries to address the sensitive issue of irregular migration with a priority on saving lives and urging humane treatment of vulnerable migrants. We also work closely with the Thai to respond to natural disasters, including the devastating 2008 cyclone in Burma and the earthquakes in Nepal earlier this year. We care deeply about our bilateral relationship and about the people of Thailand. If confirmed, I will work closely with this committee to advance our broad range of interests in Thailand. While we will continue to do much together, we look forward to its return to democracy so that our joint efforts can reach their fullest potential. We believe the Kingdom of Thailand can find reconciliation, establish democracy, and fulfill its historic destiny as a great and free nation. Thank you again for considering my nomination. I look forward to answering your questions.